Flammable liquids or certain plastics, such as those found in refineries, rubbish incinerators or tyre stores, have fire properties that cannot be controlled with conventional fire protection systems. Fire spreads out very quickly and it forms toxic fumes. Modern foam systems offer effective and environmentally friendly extinguishing properties for each risk. Foam extinguishing systems work with extinguishing water to which a foaming agent is added. This foam solution is then foamed using foam nozzles or monitors with a metered amount of air. 10 to 1,000 litres of foam can be mixed from one litre of foam solution that contains 1 to 6% of foaming agent. According to the mixing ratio (VZ) to air, the resulting foam can be sub-divided into three classes with different characteristics: low expansion foam, medium expansion foam and high expansion foam. Further specific characteristics can be added to the foam via the choice of the foam extinguishing agent, so that optimal fire fighting is achieved for each fire risk. The extinguishing agents are environmentally friendly and can be used safely. When using extinguishing foam, different quenching effects are tailored specifically and effectively to the fire risk and the premises that are to be secured. Various foam generators are produced to match the extinguishing foam to be produced. Foam sprinklers can be used for example to protect gantries extensively with low expansion foam, because it can easily cover the potential burning material. High expansion foam generators are used in rack storage to flood the room quickly and completely. Generators are used in tanks to generate large amounts of low expansion foam in the shortest possible time, while large open-air areas are secured with foam monitors. In contrast to water, foam is lighter than many flammable liquids and remains so when applied to the fire as a separating layer on the surface of the liquids. This prevents the oxygen supply and suppresses the fire. A special feature of the separation effect is the formation of a liquid film between the burning material and foam. This film flows ahead of the foam on the burning material, ensures high flow rates for particularly good extinguishing properties and reduces the risk of re-ignition. On waterproof flammable material (non-polar hydrocarbons such as mineral oil), a thin aqueous surfactant film may form, while on water soluble flammable material (polar hydrocarbons, such as alcohol) a polymer film may form – depending on the foaming agent. This polymer film may only form if the foam is applied at low pressure if no turbulence arises in the flammable material. The low thermal conductivity of the foam blanket isolates potential flammable material from the heat of the flames, preventing the fire from spreading. A complete foam blanket suppresses the evaporation of burning and volatile materials. Flammable gases can therefore not fuel the fire and toxic gases are also prevented from entering the environment. At the same time the flammable material is cooled. The gas pressure, and thus also the re-ignition risk, is reduced. If the formation of the film quickly covers the flammable material, the mass of the extinguishing foam is required to reliably prevent the opening of the blanket effect. At the location of the flames, the water and foam extinguisher medium evaporates and removes heat from the combustion zone. The surface of the foam and thus the cooling effect is massively increased by the foaming effect. The flooding of system components, channels and spaces (especially with fine, high expansion foam) displaces oxygen and combustible gases from the fire. 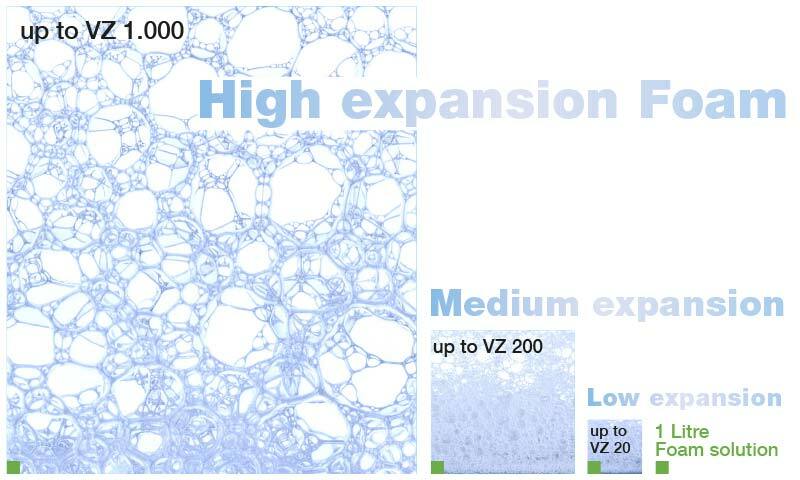 Low expansion foam is produced with a small mixture of air (to VZ 20). This results in a wet, fine-bubble foam, which is free flowing. Its high weight and low volume makes it particularly combustion-stable, gas-tight and prevents re-ignition. Depending on the composition, it has the property of adhering to three-dimensional surfaces. Its extinguishing effect is mainly due to the cooling effect and release effect, which can be exacerbated by water film formation or polymer film formation – it also has very good coverage. The very high flow is recommended for fighting liquid fires. In the case of solid fires, its high adhesion has a particularly favourable effect. Low expansion foam is produced by a foam pourer, foam sprinkler and foam tubes in fixed and mobile fire extinguishing systems. Low expansion foam is quickly distributed over the entire fire surface, forming a gas-tight, insulating and cooling blanket over a longer period of time. The preventative use of the blanket effect effectively prevents the emission of toxic or flammable gases. Because of its heavy weight, it is especially suitable for fire fighting operations over long ranges from a safe distance to the fire. With water film-forming foam extinguishing agents, it can be used either foamed and as an unfoamed water solution and is also suitable as an extinguishing agent for sprinkler and deluge systems. The large water excretion rate of such mixtures strengthens the fluidity, while reduced surface tension particularly favours spraying on solid fires. 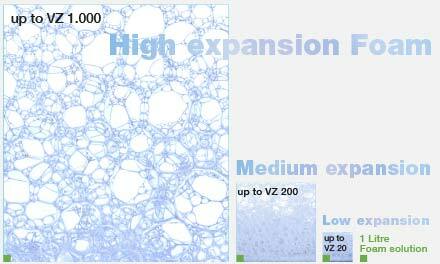 Medium expansion foam is generated with more air injection (VZ 20 to VZ 200). Depending on the foaming, a fine-bubbled foam with a relatively high water content or grossly blistered, dry foam at a light weight and high volume is obtained; this can also be built up and protects and extinguishes three-dimensional objects. 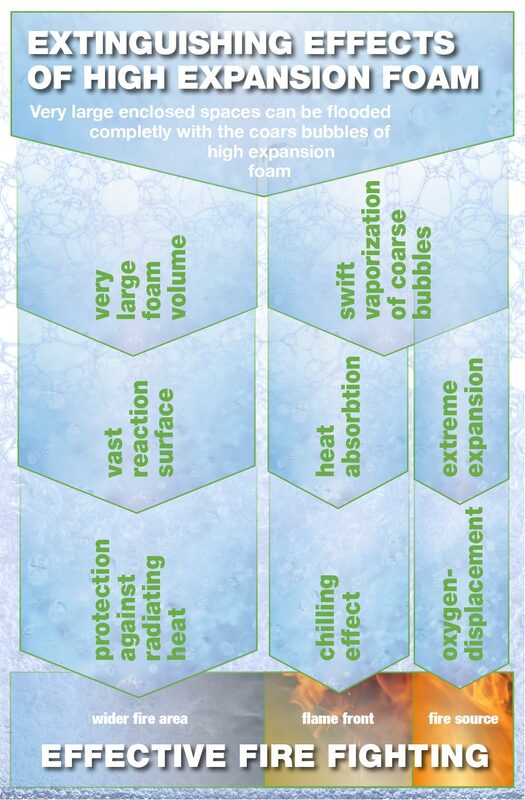 The medium expansion foam extinguishes using a combination of a cooling effect, separating effect and penetration effect which makes it very versatile. In a foam tube, the foaming agent solution is mixed with air and then compressed and foamed under pressure through a screen mesh. Thus relatively a lot of foam is produced very quickly. Medium expansion foam spreads quickly to fire surfaces and forms closed impermeable foam blankets. This foam achieves good success in the case of liquid fires. The wide range of 20 to 200-fold foaming agent foam makes it a versatile extinguisher medium. With high foaming, the displacement effect is used in particular for flooding flat areas and quickly building up large quantities of foam. 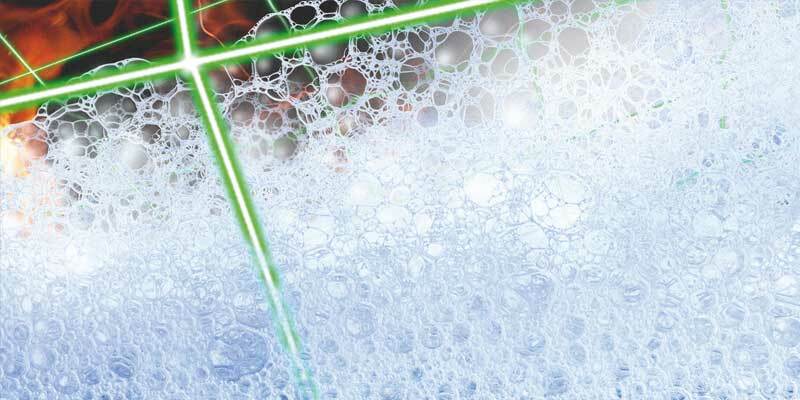 At 50 to 100-fold foaming and large ranges of up to 12 m, foam can be issued gently and this is particularly well suited to fighting plastic, ember and liquid fires, whereas with lower foaming high ranges of up to 35 m can be implemented. 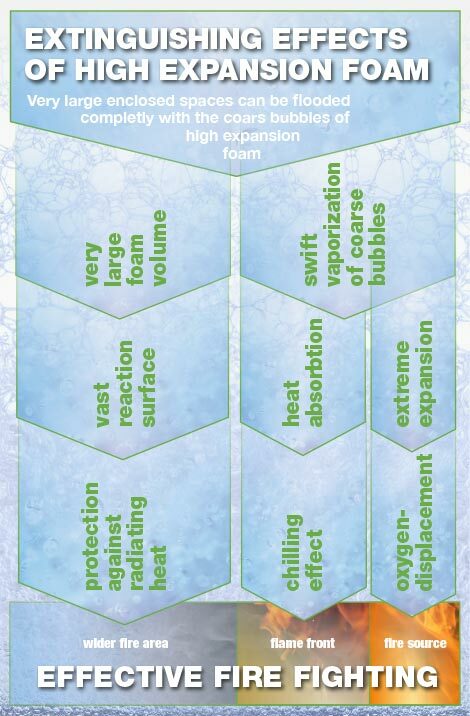 High expansion foam is produced with large air injection (up to VZ 1000), thus providing a huge volume of foam. It is grossly blistered and dry and cannot be thrown because of its low weight. Cooling effect, insulating effect and penetration effect are responsible for most of the extinguishing effect. The coarse bubbles are rapidly destroyed at the flame front. They form the smallest water droplets that evaporate at high temperatures and immediately form 1640 times the volume of water vapour. The ambient air is highly diluted and the energy required for the evaporation process is extracted from it. The fire gets less oxygen and is cooled. Remaining foam and water droplets form soot particles and water-soluble fumes. In addition, the environment is shielded from the heat of the fire. High expansion foam generators are installed within the extinguishing area; they consist of extinguishing nozzles, which nebulize the foam-water mixture and press it through a screen, on which the mixture is foamed using incoming air. The most effective use of high expansion foam is in enclosed spaces. The enormous volume of foam enables the complete flooding of the largest objects. Due to the low water content there is little water damage, so that high expansion foam is also suitable for preventative use. Flammable gases are displaced and objects are effectively isolated from flames and heat.